In recent years, particularly since Xi Jinping’s ascension to power, it has become commonplace for journalists and experts in the United States to describe China’s external behavior as growing increasingly assertive, even revisionist. Many commentators have attributed this shift to Xi, suggesting a causality between his leadership and China’s growing assertiveness. To many in the West, China’s rapid rise in national power is viewed as a challenge to the post-World War II international order, an order rooted in rules and norms that was designed to guard against a return of great power rivalries. China’s own narrative of its rise, and of its historic identity, stands in contrast. China views its rise as leading to a restoration of the natural order of international relations, with China as the world’s largest economy and center of global power. China views its “century of humiliation” beginning with its loss to Western powers in the Opium War (1840-42) and its subsequent political subjugation and national fragmentation as a historic aberration, a stain on the country’s long and proud history, and a wrong in need of righting. The Chinese Communist Party drew on such sentiments for its founding in 1921, and it has nurtured this narrative as a central organizing principle for the past century. Through education and propaganda, the Communist Party has juiced this narrative to spur citizens to work hard and return China to its past glory. It also has driven a narrative that the West and Japan are determined to keep China down, and that only the Communist Party is strong enough to guide China in overcoming outside pressure to become wealthy, powerful, and whole again. Beijing sees itself as progressing along a continuum that leads eventually to China’s return to the center of East Asia and a restoration of its role as a leading global power. As China’s relative power has grown, its desire to accelerate progress along this continuum has intensified. President Xi is the latest leader seeking to push China toward its long-held goals. In his first four-plus years as leader, Xi has proven adept at giving expression to China’s progress, and to the Communist Party’s purpose. He has summoned China’s 1.4 billion citizens to contribute to the “great rejuvenation of the Chinese nation,” and he has concentrated the Communist Party on two “centenary goals”: first, to double China’s GDP and per capita income relative to 2010 by the 100th anniversary of the founding of the Chinese Communist Party in 2021 in order to make China a “moderately prosperous society”; and second, to turn China into a prosperous, strong, advanced country by the centenary of the founding of the People’s Republic of China in 2049. Under Mao’s rule (1949-1976), China’s foreign policy started out organized largely around ideology. This orientation caused Beijing at first to privilege its relations with Moscow. It also contributed to China’s decision to enter into the Korean War. Over time, and particularly during the Cultural Revolution, domestic upheaval and dissatisfaction with Moscow scrambled China’s foreign policy, creating an opening for President Nixon to pursue détente with Chairman Mao in 1972. Nevertheless, to assuage more hawkish constituencies, China did become more reactively assertive during this period. Whereas Beijing did not proactively challenge its neighbors over maritime territorial disputes, it did impose costs that exceeded its earlier responses when disputants took actions that Beijing defined as challenging China’s interests. Examples of this behavior included China’s physical seizure of Scarborough Shoal and its halting of certain Philippine imports after the Philippines detained a Chinese fishing boat in disputed waters for violating Philippine fishing regulations. Similarly, China banned rare earth exports to Japan in reaction to Japan’s enforcement of domestic maritime laws in disputed waters with China. More subtly, China also seems to have calibrated its state-directed investments in Southeast Asia on the basis of whether host governments were more or less active in challenging China’s maritime claims. These types of responses came to symbolize that China’s relative national strength had reached a level whereby it could punish those who challenged its interests, particularly on territorial issues, while maintaining confidence in its ability to preserve a stable external environment to support its domestic development. These events also coincided with the spread of social media in China, a phenomenon which gave China’s leadership a window, for the first time, to observe that a more muscular approach to foreign affairs garnered widespread public support throughout China. 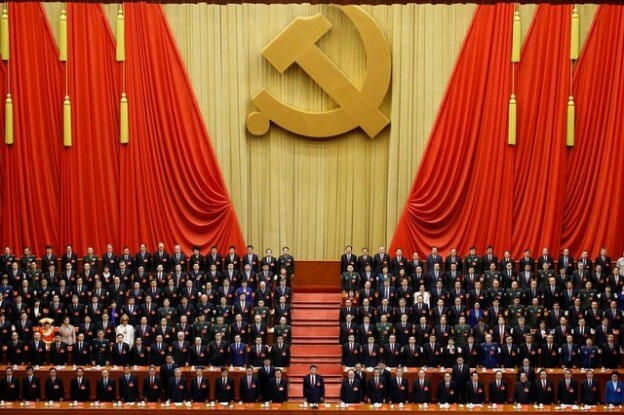 Throughout this period, an implicit compact formed inside China: The Communist Party would continuously improve living standards and elevate China on the world stage, and in return, Chinese citizens would not challenge the Communist Party’s monopoly on power. China’s citizens enjoyed an unprecedented period of human progress, during which more people were lifted out of poverty than in any other society in human history. There were pockets of discontent that metastasized into challenges against Communist Party rule, the most notable example being the student-led Tiananmen protests in 1989, but, by and large, the Communist Party’s grip on power was strong. The Communist Party maintained firm control over the military, domestic security services, and propaganda apparatus. China’s rapid economic growth also fueled its military advancement. Through several decades of double-digit growth in its military budget, the People’s Liberation Army went from bloated and backward to well-funded, technologically advanced, and increasingly agile. But by 2012, cracks in the edifice of Communist Party rule started to become more visible. Questions began to intensify about the continuing viability of China’s export- and investment-led economic model. China’s economic growth rate began what appears to be a terminal deceleration back toward the mean. Capital flight intensified, raising questions about public confidence in the competence of the Communist Party’s continued rule. Public dissatisfaction with the scale of official corruption became magnified through social media. Fissures at the top of the Communist Party spilled into public view. And China’s external environment seemed to be growing more complex, with the United States engaging in a “rebalance to the Asia-Pacific” that enjoyed widespread support throughout the region, raising the risk of regional bandwagon against China’s rise, an outcome that the country’s passive foreign policy was designed to prevent. China’s foreign policy under President Xi is the story of how Beijing has responded to its own vulnerabilities while continuing to nurture its long-held ambitions of returning China to its historic place at the center of the global stage. Recognizing that Marxism – Leninism holds little sway among the majority of Chinese people, President Xi has invested heavily in improving governance, maintaining stable economic growth, and nurturing pride and patriotism to buttress the Communist Party’s legitimacy. Above all, President Xi sees it as his duty to protect the Communist Party’s monopoly on power. From early in his tenure, President Xi focused on building a strong military, viewing it as key to restoring China to its past position of prestige. He made his leadership of the military a hallmark of his rule. He oversaw double-digit growth in defense spending, prioritized the development of a cutting-edge military industrial complex, secured access to advanced weapons systems from Russia, prioritized rooting out corruption in the top ranks, and urged doctrinal improvements to support greater consolidation of operations. He showcased his support for the military by being photographed in fatigues and attending military parades. In 2017, the state-run media outlet Xinhua started referring to Xi as the military’s supreme commander, a title previously reserved for Mao and Deng after they had consolidated control over the PLA. Beijing also sought to deepen regional countries’ economic dependence on China. It accomplished this primarily through major deals announced during Xi’s travel abroad and his government’s directing of trade and investment flows through the actions of pliant state-owned enterprises and state-directed policy banks. Whereas a decade ago, all but for one of China’s neighbors traded more with the United States than with China, now China is the largest trading partner for all of its neighbors. Cumulatively, these parallel efforts formed the backbone of China’s strategy in the first years of Xi’s rule. The equation was essentially: use military superiority and economic dependence to compel neighboring countries to acquiesce to China’s top interests, thereby creating a benign environment for China’s domestic development and a platform for consolidation of regional leadership. Not all of Beijing’s moves were well-calibrated, however. The decision in 2013 to declare an air defense identification zone (ADIZ) over contested waters in the East China Sea, for example, soured relations with Japan and South Korea and set off alarm throughout the region that China was adopting a militarily muscular approach to bigfoot other countries. Then, in 2014, China blundered by moving an oil exploration rig into contested waters with Vietnam, sparking a wave of anti-China protests throughout the country and causing Vietnam to hedge by moving closer to the United States. Additionally, China provoked India along its contested border in 2015 and 2017, resulting in India hedging by increasing security cooperation with the United States, Japan, and Australia. Xi has cultivated a sense of China being on the march in other ways, as well. The PLA fielded its first aircraft carrier. The PLA has also more regularly operated outside of the first-island chain and throughout the Asia-Pacific, and it has become a leading global arms exporter. For the first time in modern history, China established a permanent overseas military presence by opening a base in Djibouti. During this same period, regional countries – with the notable exceptions of Vietnam and Japan – appeared to grow more cautious in challenging China over territorial disputes, due to the perceived risks of economic or other retribution. This, in turn, fed Beijing’s belief that its strategy is making headway in the direction of consolidating control over China’s disputed territorial claims and reestablishing itself as the preeminent power in East Asia. At the same time, Chinese leaders were careful to avoid direct confrontation with the United States in the Asia-Pacific. Mindful that they did not possess the capacity (or the region’s support) to push the United States out of the region, Chinese leaders worked to tamp down Washington’s concerns by declaring that the Pacific was big enough for both powers, that China did not seek to push the United States out of Asia, and that China respected the United States’ role in the region. At the same time, the US and Chinese militaries adopted protocols at sea and in the air to mitigate risk of accidental collisions that could trigger unintended escalation, as US and Chinese forces increasingly operate in closer proximity to each other throughout the Asia-Pacific. President Xi advocated for a “New Model of Great Power Relations” between the United States and China, whereby both sides would seek to accommodate the top interests of other in order to avoid falling into a Thucydides trap of conflict between a rising power and an established one. China’s leaders soberly assess that a slide into hot rivalry with the United States would bring China’s modernization drive to a halt and push the “China dream” out of reach. In effect, China has sought to hold its complex relationship with the United States as a relatively stable and constant variable as it has worked to make gains elsewhere. One major exception to China’s pattern of opportunistic activism in East Asia has been its handling of North Korea. China demonstrated hesitance in responding to North Korea’s rapid nuclear and missile advances, even as the United States and others urged China to take on more leadership in addressing the challenge. Following major recent North Korean provocations, such as underground nuclear detonations and flight tests of intercontinental ballistic missiles, China went along with heightened United Nations Security Council sanctions on North Korea. But, in every round of negotiations, China sought to water these efforts down to the maximum extent possible. There are five reasons for China’s caution on North Korea. First, China does not share the same threat assessment as the United States and others about North Korea’s nuclear ambitions. Beijing views Pyongyang’s programs as inherently defensive in nature (i.e., to deter invasion from the United States), and does not believe Kim Jong-un would take the suicidal step of initiating conflict. Second, China is profoundly wary of US strategic intentions vis-à-vis North Korea. China is concerned that the United States is inflating the threat from North Korea as a pretext for degrading Beijing’s strategic environment through forward deploying missile defense systems, tightening military alliance relationships with and among the Republic of Korea and Japan, and moving the United States’ most advanced weapons systems to China’s immediate periphery. As such, influential voices in Beijing regularly counsel against acceding to US requests for China to ramp up pressure on North Korea, because they believe it would effectively serve to abet US actions to undermine China’s strategic interests. Third, China is skeptical that the United States or the Republic of Korea would initiate an attack on North Korea, given the deadly consequences for South Korea and Japan that would likely follow. As a result, China is less alarmed about the risk of rapid escalation than the United States. Fourth, China is dubious that South Korea and/or Japan will respond to North Korea’s weapons advances by deciding to go nuclear themselves, or even that they will significantly enhance their own conventional military capabilities. Finally, there remains a lack of consensus in Beijing for seriously squeezing North Korea, both because of fear that such actions would invite the very outcome China’s strategy is designed to prevent (i.e., regime collapse, societal upheaval, instability along China’s border, and refugee flows into China), and also because conservative, military-affiliated voices inside China do not want their predecessors’ sacrifices during the Korean War to have been made in vain. Looking beyond the Asia-Pacific, China has grown increasingly active in recent years. It has deepened relationships with virtually every other major actor outside of the region, both to bolster its role as an influential global player, and also to dilute any risk of a return to unipolarity, with the United States as the preponderant power. China did not seek to challenge the United States directly for global influence so much as it has endeavored to cultivate acceptance of China as a peer or near-peer of the United States throughout the world. As it undertakes these efforts, Beijing found a largely willing partner and supporter in Moscow. The national identities of both countries are forged in opposition to being lesser powers than the West. Both countries view the evolution of the post-World War II international order as disproportionately benefitting the West. Both countries harbor fears that promotion of democracy, human rights, and rule of law is a subversive tool of statecraft intended to trigger instability and degrade the challenge that their rise presents to the established, Western-led order. Both countries also seek greater strategic space to pursue their own interests in their respective peripheries. To be sure, there are limits to China-Russia strategic convergence. China, for example, is more content to adapt the existing international order than to upend it, as Russia would prefer. China also seeks to maintain generally stable ties with the United States, whereas Russia has shown a greater tolerance for elevated friction. There also are areas where Russian and Chinese interests are in tension, such as: Russia’s willingness to sell advanced weaponry to possible Chinese adversaries; both countries’ competition for influence in Central Asia; Russia’s unwillingness to go along with past Chinese efforts to isolate Japan; and Russia’s reticence about China playing a greater role in Arctic affairs, a domain that Moscow has long viewed as within its strategic purview. Nevertheless, Beijing and Moscow have largely overlapping views on fundamental issues of identity, anxieties about internal subversion, and ambitions for regional preeminence. Increasingly, they have shared “best practices” on suppressing dissent and limiting outside influence in internal affairs. In the process, and through their examples, the two countries have spurred somewhat of an organic authoritarian counteroffensive to the global spread of political freedom and democratic accountability. At the same time, China believes its national power has reached a stage to enable it to take bolder and more visible steps toward the center of the world stage. To do so, China seeks to strengthen its voice within existing multilateral institutions and to establish new international institutions within which it holds outsized influence. On the former, China substantially increased its voting share in the world’s leading economic bodies, the International Monetary Fund and the World Bank. It also aggressively pushed to place Chinese officials in leading roles throughout multilateral organizations, including the World Trade Organization, World Health Organization, Interpol, and throughout the United Nations system. Beijing also launched new organizations and endeavors to expand its influence and showcase its global convening power. It played a leading role in launching the Brazil-Russia-India-China-South Africa (BRICS) New Development Bank, including by providing $10 billion of capitalization. The bank, headquartered in Shanghai, has become an alternative for the developing world to access capital for development projects without having to subject themselves to intrusive requirements often imposed by existing multilateral development banks. In 2015, China launched the Asian Infrastructure Investment Bank (AIIB), ostensibly to address a funding shortfall for infrastructure investment in Asia and beyond. The bank, headquartered in Beijing, attracted 56 members and raised $100 billion in subscribed capital, already making the bank two-thirds the size of the US- and Japan-led Asia Development Bank (ADB), and quickly emerging as a potential future peer to the World Bank. By launching these banks, China accomplished three objectives. First, it demonstrated that it is a central player in global finance and development, and not just one of many voices within the existing global economic architecture. Second, it gave a jolt of confidence to Chinese citizens that China is becoming recognized abroad as a leading actor on the global stage. Third, it enabled China to make these strides in a manner that least arouses alarm in the West about China’s rise. China argued with success that it is not seeking to dismantle the existing international architecture, but rather to supplement and shore it up by filling gaps left unaddressed by established international institutions. While the launch of these banks was significant, Xi’s signature “Belt and Road Initiative” (BRI) was even more audacious. If realized, the BRI will eventually link China more directly with countries throughout the Asia-Pacific, Central Asia, the Middle East, Africa, Europe, and even the Western Hemisphere via road, rail, pipeline, cable, and maritime routes, creating a twenty-first century dynamic whereby “all roads lead to Beijing.” The scale of ambition is significant. The BRI seeks to mobilize $1.3 trillion in capital, making the initiative 12 times larger than the post-war Marshall Plan for Europe in inflation adjusted terms. The undertaking will aim to include over 60 countries with a population of around 4.4 billion people, more than 60 percent of the world’s total. For China, the BRI delivers numerous benefits. It enables a productive outlet for its $3 trillion in capital reserves, supports greater internationalization of the renminbi, generates global momentum for setting standards that align with China’s own, and transfers domestic overcapacity in steel, cement, and machinery abroad. The scale of the BRI provides Beijing leverage with other countries to push for preferential trade and investment relationships for Chinese enterprises. The initiative helps China improve its energy security through more direct overland access to Russian, Central Asian, and Iranian oil and gas, thus mitigating concerns about the US Navy disrupting maritime supply routes in the event of heightened tensions. It also helps China cope with transitioning from an investment-led economic growth model to a consumption-based model. As Yale economist Stephen Roach has observed, the consumption share of GDP growth has risen just 2.5% since 2010, due in large part to high levels of fear-driven precautionary spending tied to concerns over China’s weak social safety net. In effect, through the BRI, China is looking to overcome domestic headwinds by drawing on external sources of growth to compensate for suboptimal internal demand. The final element of China’s opportunistic activism in foreign affairs is much less quantifiable, but of potentially longer-term significance. Following the US election of Donald Trump, China’s top leaders have stepped forward in previously unforeseen ways to seize the mantle of global leadership. This began with President Xi’s speech to global elite in Davos on the eve of Trump’s inauguration about the importance of upholding free trade, and has extended to efforts by China to position itself as the true leader of global environmental efforts. Similarly, National People’s Congress Chairwoman of Foreign Affairs Fu Ying wrote in June 2017 that the US-led international order has been found wanting, and that China’s newfound strength has allowed it to update the international system in a manner that better enables countries to address transnational challenges. Fu acknowledged in her article that China’s new activism has aroused “unfounded suspicion by some, that China’s departure from its longtime passive posture is a sign of it challenging the US-led world order.” However, she concludes that China’s strength has reached a level whereby it can afford to push for adjustments that better accommodate China’s role in the international system. Such statements by two of the country’s most senior officials responsible for foreign affairs reflect a significant shift in China’s view of itself and its place in the world. No longer content to preserve a benign external environment and concentrate on domestic development, China now openly signals its desire to stride to the center of the global stage, even if doing so arouses anxieties abroad about China’s rise. While China’s foreign policy ambitions are now much more visible, their success is not a foregone conclusion. Beijing still confronts a thicket of domestic and external challenges that, if not effectively managed, could trip up its efforts. The first challenge is managing the many internal contradictions in Chinese foreign policy. As China becomes more active abroad, its efforts to reconcile competing interests are becoming more complex. Examples of these competing interests include: protecting sovereignty and territorial integrity; modernizing China’s military; sustaining an image of China’s “peaceful rise” and avoiding actions that trigger regional bandwagon to challenge China’s rise; upholding the principle of non-interference in the internal affairs of other countries; protecting access to markets, capital, and resources that fuel China’s continued economic growth; maintaining constructive relations with other major powers; preserving solidarity with other developing countries; and promoting an image of China as an upholder of and contributor to regional and global security. China’s stove-piped and poorly coordinated foreign policy bureaucracy compounds the challenge for Beijing of reconciling these competing impulses. The second major challenge China faces is executing the BRI at a level reflecting the outsized expectations China has set for the program at home and abroad. Many of the envisioned projects are in regions prone to sectarian violence and political upheaval. There are complicated legal obstacles, given the patchwork of national laws that all of the imagined routes will need to navigate. Many traverse countries with entrenched corruption. There are risks of populist blowback to the projects, particularly if they become viewed as lining the pockets of the powerful, failing to create local jobs, or being exploitative in nature. There also is a question about debt sustainability, given that China is not giving away funding for the projects, but rather extending loans to host governments for projects that China wants to build. Finally, there is the question of whether BRI will hinder China’s domestic reforms, particularly of state-owned enterprises, given that they will receive a financial lifeline through BRI, which may limit pressure on them to reform. If BRI develops a reputation for overpromising and under-delivering, it could generate reputational risks for China’s image around the world, causing countries to second guess their assumptions about the risks and rewards of complying with China’s requests. The third major challenge will be avoiding a breakdown in relations with the United States. As previously discussed, there is a structural misalignment in expectations on North Korea that will be difficult for both countries to reconcile, particularly as perceptions of the threat from North Korea become more acute and politically salient in the United States. US-China relations also face the risk of trade frictions escalating into a trade war. Beijing calculates that the United States cannot afford a breakdown in relations with China due to the economic losses and diminished ability to deter North Korea that would result. However, given the unconventional nature of President Trump and the popular vein of support he tapped when talking tough about confronting China, Beijing’s assumptions about the US approach to the relationship may be challenged. The fourth major challenge will be maintaining a relatively stable periphery. Just in the past year, China threatened military conflict with Vietnam and India over territorial issues. China-Japan tensions remain elevated. Friction between China and Indonesia became more pronounced. China’s economic punishment of South Korea over its installation of a missile defense system to protect against North Korean attack soured bilateral relations and caused public opinion of China to plummet. China has lingering concern about “losing” Myanmar to the United States and the West. Risk of unintended escalation in the South China Sea remains real, particularly as more forces from claimant countries operate in closer proximity to one another. China persistently demonstrated clumsiness in its efforts to influence democratic governments. The risk of conflict on the Korean Peninsula also complicates China’s strategic picture. The fifth major challenge will be managing Taiwan and Hong Kong. There is a risk that Xi will get locked into a commitment trap on either or both. He set expectations for progress under his watch on the path of national unification, and if progress appears halting or uncertain, pressure could mount on Xi to take more aggressive actions against one or both of them. Finally, there is the outstanding question of how much runway China has left on its national rise before demographic and economic laws of gravity set in. China is attempting to accomplish what no other country has pulled off in terms of its transition from an investment- and export-led growth model to a consumption-based model, all while maintaining high levels of leverage as it navigates through the middle-income trap. China’s society is also aging rapidly. By 2040, the country’s demographic profile could resemble Japan’s today, but on a significantly larger scale. Additionally, as China’s citizens become more connected through social media, their ability to organize and mobilize (e.g., to protest against injustices or petition for greater protection of their constitutional rights) will grow stronger. The demands of an increasingly educated, wired, urban, and aging citizenry will present a complex governance challenge for the Chinese Communist Party. Absent an unforeseen event, China’s opportunistic activism on foreign affairs will continue during President Xi’s second term following the 19th Communist Party Congress in mid-October. Beijing believes its strategy is working; as China’s relative strength has grown, other countries’ tolerance for confrontation with China has shrunk. While China’s progress in rapidly raising its stature in global affairs has been nothing short of historic, and its global ambitions are now much more visible, it would still be a mistake to assume that China’s advances at home or abroad will continue along a linear trajectory. Beijing confronts numerous serious challenges at home and abroad, such as reconciling contradictions in the canon of Chinese foreign policy, meeting lofty expectations for BRI projects, avoiding a breakdown in relations with the United States, mitigating risk of conflict along its periphery, peacefully managing relations with Taiwan, and overcoming the middle-income trap amidst an aging society. These many uncertainties, any one of which could fundamentally alter China’s trajectory, should instill modesty in the minds of any observer seeking to forecast China’s evolving role in world affairs.